ABOUT THE EVENT: D2D is an initiative by like-minded people who have come forward to bring awareness on the worthy causes and to raise funds mainly for the underprivileged children through the event of D2D. 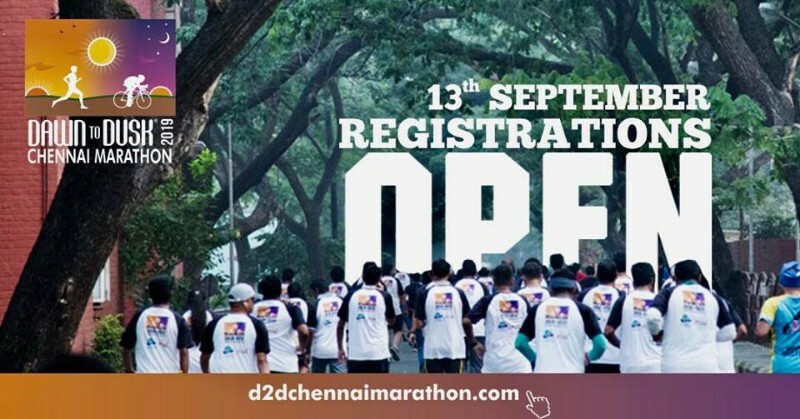 The event D2D has also inspired many participants to run and pedal for a cause at different times for the underprivileged children and many charitable organizations till date. The 7th edition of Dawn To Dusk Chennai Marathon will raise funds for the 2nd consecutive year for Cancer Institute (WIA), Adyar. The funds raised from this event will be used mainly for the children affected by Cancer towards their treatment. FLAG-OFF TIME & ROUTE: Will be informed through mailer to registered participants closer to the event. FLAG-OFF TIME & ROUTE: Will be informed through mailer to registered participants closer to the event. The Kids run will take place inside Anna University campus ground and can also run with their parents. Completion Certificate *Completion Certificate. We will provide the children with hardcopy Completion certificate post completion of the event. REGISTRATION: Please register at the earliest as this will help Tamil Nadu Cycling Club (TCC) to arrange for logistics and other arrangements at the venue.